Van Jones, best-selling author of The Green Collar Economy and a senior fellow at the Center for American Progress, will headline a line-up of top leaders in the energy industry at the Black Enterprise Conversation on Energy Forum, Part II, on Monday, November 8, 2010 at The Liaison Hotel Capital Hill in Washington, D.C.
Jones will help kick-off discussion of energy issues and African Americans. 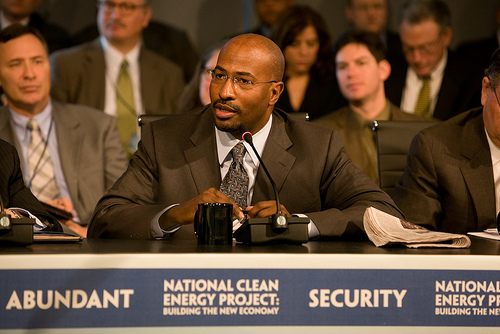 Van Jones, best-selling author of The Green Collar Economy: How One Solution Can Fix Our Two Biggest Problems and a senior fellow at the Center for American Progress, will headline a line-up of top leaders in the energy industry at the Black Enterprise Conversation on Energy Forum, Part II, on Monday, November 8, 2010 at The Liaison Hotel Capital Hill in Washington, D.C. Jones, who is also founder and senior policy advisor for Green For All, a non-government organization dedicated to “building an inclusive green economy strong enough to lift people out of poverty,” will join Black Enterprise Editorial Director Sonia Alleyne in a one-on-one interview session, followed by Q&A with forum attendees. Jones was appointed by President Barack Obama to the newly created position of Special Advisor for Green Jobs, Enterprise and Innovation at the White House Council on Environmental Quality, a position he held through September 2009. The Black Enterprise Conversation on Energy, Part II will also include panels featuring top energy company executives, economists, green-economy activists and association leaders, with a focus on challenges and opportunities related to energy responsibility and sustainability for African American communities, workers and business owners. The upcoming forum takes place at a time of heightened concern about safety in the face of growing global demand for energy, particularly in the aftermath of the Deepwater Horizon oil spill in the Gulf of Mexico earlier this year. The panels will also address how African Americans can gain greater job and business opportunities in the energy industry and will answer and discuss questions submitted by visitors to the Black Enterprise/Shell Conversation on Energy web site. A panel on Energy Responsibility, to be moderated by Alleyne, will include Green For All CEO Phaedra Ellis-Lamkins, Shell Oil Company VP of Technical Support/Deep Water Ernst den Hartigh, Urban Solutions Inc. President and CEO Dan Packer, and Entergy Inc. Executive VP and Chief Administrative Officer Roderick West. A second panel on Energy Independence, to be moderated by Black Enterprise Senior VP and Editor-at-Large Alfred Edmond Jr., will include Tacoma Power Senior Utilities Economist Bill Dickens, Shell Oil Company VP of Investor Relations/North America J. Harold Hatchett III, Green Port Senior Executive for Global Strategies Jerome Ringo and American Association of Blacks in Energy President and COO Frank Stewart. Remarks will also be delivered by Black Enterprise President and CEO Earl “Butch” Graves Jr., Shell Oil Company VP of Communications/Americas Tracy Faulkner and U.S. Environmental Protection Agency Assistant Administrator Craig E. Hooks. This is the second forum held this year featuring experts in the fields of energy security, renewable and alternative fuels and energy innovation. The first Black Enterprise Conversation on Energy event was held in January 2010, also in Washington, D.C. The forums are presented in partnership with Shell Oil Company. To submit your questions for discussion at next week’s forum, go to A Conversation on Energy at http://www.blackenterprise.com/energy-forum/. You can also follow the conversation via the Twitter hashtag #BEEnergyForum.